Thomas Paine (January 29, 1737  (NS February 9, 1737) – June 8, 1809) was an English-American political activist, author, political theorist and revolutionary. As the author of two highly influential pamphlets at the start of the American Revolution, he inspired the American Patriots in 1776 to declare independence from Britain. His ideas reflected Enlightenment era rhetoric of transnational human rights. He has been called "a corsetmaker by trade, a journalist by profession, and a propagandist by inclination." Paine lived in France for most of the 1790s, becoming deeply involved in the French Revolution. He wrote the Rights of Man (1791), in part a defense of the French Revolution against its critics. His attacks on British writer Edmund Burke led to a trial and conviction in absentia in 1792 for the crime of seditious libel. In 1792, despite not speaking French, he was elected to the French National Convention. The Girondists regarded him as an ally. Consequently, the Montagnards, especially Robespierre, regarded him as an enemy. In December 1793, he was arrested and imprisoned in Paris, then released in 1794. He became notorious because of The Age of Reason (1793–94), his book that advocates deism, promotes reason and freethinking, and argues against institutionalized religion in general and Christian doctrine in particular. He also wrote the pamphlet Agrarian Justice (1795), discussing the origins of property, and introduced the concept of a guaranteed minimum income. In 1802, he returned to America where he died on June 8, 1809. Only six people attended his funeral as he had been ostracized for his ridicule of Christianity. Paine was born on January 29, 1737 (NS February 9, 1737) the son of Joseph Pain, or Paine, a Quaker, and Frances (née Cocke), an Anglican, in Thetford, an important market town and coach stage-post, in rural Norfolk, England. Born Thomas Pain, despite claims that he changed his family name upon his emigration to America in 1774, he was using Paine in 1769, whilst still in Lewes, Sussex. 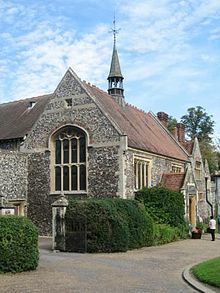 He attended Thetford Grammar School (1744–49), at a time when there was no compulsory education. At age thirteen, he was apprenticed to his stay-maker father; in late adolescence, he enlisted and briefly served as a privateer, before returning to Britain in 1759. There, he became a master stay-maker, establishing a shop in Sandwich, Kent. On September 27, 1759, Thomas Paine married Mary Lambert. His business collapsed soon after. Mary became pregnant; and, after they moved to Margate, she went into early labor, in which she and their child died. In July 1761, Paine returned to Thetford to work as a supernumerary officer. In December 1762, he became an Excise Officer in Grantham, Lincolnshire; in August 1764, he was transferred to Alford, at a salary of £50 per annum. On August 27, 1765, he was fired as an Excise Officer for "claiming to have inspected goods he did not inspect." On July 31, 1766, he requested his reinstatement from the Board of Excise, which they granted the next day, upon vacancy. While awaiting that, he worked as a stay-maker. In 1767, he was appointed to a position in Grampound, Cornwall; subsequently, he asked to leave this post to await a vacancy, thus, he became a schoolteacher in London. On February 19, 1768, he was appointed to Lewes, East Sussex, living above the fifteenth-century Bull House, the tobacco shop of Samuel Ollive and Esther Ollive. There, Paine first became involved in civic matters, he appears in the Town Book as a member of the Court Leet, the governing body for the Town. He also was in the influential vestry church group that collected taxes and tithes to distribute among the poor. On March 26, 1771, at age 34, he married Elizabeth Ollive, his landlord's daughter. From 1772 to 1773, Paine joined excise officers asking Parliament for better pay and working conditions, publishing, in summer of 1772, The Case of the Officers of Excise, a twenty-one-page article, and his first political work, spending the London winter distributing the 4,000 copies printed to the Parliament and others. In spring of 1774, he was fired from the excise service for being absent from his post without permission; his tobacco shop failed, too. On April 14, to avoid debtor's prison, he sold his household possessions to pay debts. On June 4, he formally separated from wife Elizabeth and moved to London, where, in September, the mathematician, Fellow of the Royal Society, and Commissioner of the Excise George Lewis Scott introduced him to Benjamin Franklin, who suggested emigration to British colonial America, and gave him a letter of recommendation. In October, Thomas Paine emigrated from Great Britain to the American colonies, arriving in Philadelphia on November 30, 1774. He barely survived the transatlantic voyage. The ship's water supplies were bad, and typhoid fever killed five passengers. On arriving at Philadelphia, he was too sick to debark. Benjamin Franklin's physician, there to welcome Paine to America, had him carried off ship; Paine took six weeks to recover his health. He became a citizen of Pennsylvania "by taking the oath of allegiance at a very early period." In January, 1775, he became editor of the Pennsylvania Magazine, a position he conducted with considerable ability. Thomas Paine has a claim to the title The Father of the American Revolution because of Common Sense, the pro-independence monograph pamphlet he anonymously published on January 10, 1776; signed "Written by an Englishman", the pamphlet became an immediate success. It quickly spread among the literate, and, in three months, 100,000 copies (estimated 500,000 total including pirated editions sold during the course of the Revolution) sold throughout the American British colonies (with only two million free inhabitants), making it the best-selling American book. 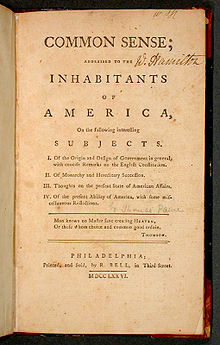 Paine's original title for the pamphlet was Plain Truth; Paine's friend, pro-independence advocate Benjamin Rush, suggested Common Sense instead. Common Sense was immensely popular in disseminating to a very wide audience ideas that were already in common use among the elite who comprised Congress and the leadership cadre of the emerging nation. They rarely cited Paine's arguments in their public calls for independence. The pamphlet probably had little direct influence on the Continental Congress's decision to issue a Declaration of Independence, since that body was more concerned with how declaring independence would affect the war effort. Paine's great contribution was in initiating a public debate about independence, which had previously been rather muted. One distinctive idea in "Common Sense" is Paine's beliefs regarding the peaceful nature of republics; his views were an early and strong conception of what scholars would come to call the democratic peace theory. Loyalists vigorously attacked Common Sense; one attack, titled Plain Truth (1776), by Marylander James Chalmers, said Paine was a political quack and warned that without monarchy, the government would "degenerate into democracy". Even some American revolutionaries objected to Common Sense; late in life John Adams called it a "crapulous mass." Adams disagreed with the type of radical democracy promoted by Paine (that men who did not own property should still be allowed to vote and hold public office), and published Thoughts on Government in 1776 to advocate a more conservative approach to republicanism. Rosenfeld argues that Paine was highly innovative in his use of the commonplace notion of "common sense." He synthesized various philosophical and political uses of the term in a way that permanently impacted American political thought. He used two ideas from Scottish Common Sense Realism: that ordinary people can indeed make sound judgments on major political issues, and that there exists a body of popular wisdom that is readily apparent to anyone. Paine also used a notion of "common sense" favored by philosophes in the Continental Enlightenment. They held that common sense could refute the claims of traditional institutions. Thus Paine used "common sense" as a weapon to delegitimize the monarchy and overturn prevailing conventional wisdom. Rosenfeld concludes that the phenomenal appeal of his pamphlet resulted from his synthesis of popular and elite elements in the independence movement. In 1777, Paine became secretary of the Congressional Committee on Foreign Affairs. The following year, he alluded to continuing secret negotiation with France in his pamphlets; the resultant scandal and Paine's conflict with Robert Morris eventually led to Paine's expulsion from the Committee in 1779. However, in 1781, he accompanied John Laurens on his mission to France. 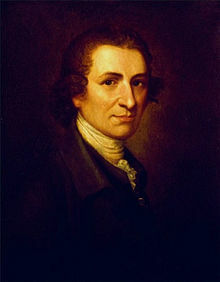 Eventually, after much pleading from Paine, New York State recognised his political services by presenting him with an estate, at New Rochelle, New York, and Paine received money from Pennsylvania and from the US Congress at George Washington's suggestion. During the Revolutionary War, Paine served as an aide to the important general, Nathanael Greene. Paine's later years established him as "a missionary of world revolution." Paine accompanied Col. John Laurens to France and is credited with initiating the mission. It landed in France in March 1781 and returned to America in August with 2.5 million livres in silver, as part of a "present" of 6 million and a loan of 10 million. The meetings with the French king were most likely conducted in the company and under the influence of Benjamin Franklin. Upon returning to the United States with this highly welcomed cargo, Thomas Paine and probably Col. Laurens, "positively objected" that General Washington should propose that Congress remunerate him for his services, for fear of setting "a bad precedent and an improper mode." Paine made influential acquaintances in Paris, and helped organize the Bank of North America to raise money to supply the army. In 1785, he was given $3,000 by the U.S. Congress in recognition of his service to the nation. Having taken work as a clerk after his expulsion by Congress, Paine eventually returned to London in 1787, living a largely private life. However, his passion was again sparked by revolution, this time in France, which he visited in 1790. Edmund Burke, who had supported the American Revolution, did not likewise support the events taking place in France, and wrote the critical Reflections on the Revolution in France, partially in response to a sermon by Richard Price, the radical minister of Newington Green Unitarian Church. Many pens rushed to defend the Revolution and the Dissenting clergyman, including Mary Wollstonecraft, who published A Vindication of the Rights of Men only weeks after the Reflections. Paine wrote Rights of Man, an abstract political tract critical of monarchies and European social institutions. He completed the text on January 29, 1791. On January 31, he gave the manuscript to publisher Joseph Johnson for publication on February 22. Meanwhile, government agents visited him, and, sensing dangerous political controversy, he reneged on his promise to sell the book on publication day; Paine quickly negotiated with publisher J.S. Jordan, then went to Paris, per William Blake's advice, leaving three good friends, William Godwin, Thomas Brand Hollis, and Thomas Holcroft, charged with concluding publication in Britain. The book appeared on March 13, three weeks later than scheduled, and sold well. Undeterred by the government campaign to discredit him, Paine issued his Rights of Man, Part the Second, Combining Principle and Practice in February 1792. It detailed a representative government with enumerated social programs to remedy the numbing poverty of commoners through progressive tax measures. Radically reduced in price to ensure unprecedented circulation, it was sensational in its impact and gave birth to reform societies. An indictment for seditious libel followed, for both publisher and author, while government agents followed Paine and instigated mobs, hate meetings, and burnings in effigy. The authorities aimed, with ultimate success, to chase Paine out of Great Britain. He was then tried in absentia, found guilty though never executed. In summer of 1792, he answered the sedition and libel charges thus: "If, to expose the fraud and imposition of monarchy ... to promote universal peace, civilization, and commerce, and to break the chains of political superstition, and raise degraded man to his proper rank; if these things be libellous ... let the name of libeller be engraved on my tomb". Paine was an enthusiastic supporter of the French Revolution, and was granted, along with Alexander Hamilton, George Washington, Benjamin Franklin and others, honorary French citizenship. Despite his inability to speak French, he was elected to the National Convention, representing the district of Pas-de-Calais. He voted for the French Republic; but argued against the execution of Louis XVI, saying that he should instead be exiled to the United States: firstly, because of the way royalist France had come to the aid of the American Revolution; and secondly because of a moral objection to capital punishment in general and to revenge killings in particular. He participated to the Constitution Committee that drafted the Girondin constitutional project. 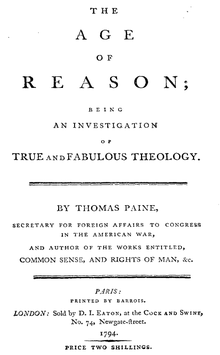 Before his arrest and imprisonment in France, knowing that he would probably be arrested and executed, Paine, following in the tradition of early eighteenth-century British deism, wrote the first part of The Age of Reason, an assault on organized "revealed" religion combining a compilation of the many inconsistencies he found in the Bible with his own advocacy of deism, calling for "free rational inquiry" into all subjects, especially religion. The Age of Reason critique on institutionalized religion resulted in only a brief upsurge in deistic thought in America, but Paine was derided by the public and abandoned by his friends. Arrested in France, Paine protested and claimed that he was a citizen of America, which was an ally of Revolutionary France, rather than of Great Britain, which was by that time at war with France. However, Gouverneur Morris, the American minister to France, did not press his claim, and Paine later wrote that Morris had connived at his imprisonment. Paine narrowly escaped execution. He kept his head and survived the few vital days needed to be spared by the fall of Robespierre on 9 Thermidor (July 27, 1794). In 1800, still under police surveillance, Bonneville took refuge with his father in Evreux. Paine stayed on with him, helping Bonneville with the burden of translating the "Covenant Sea." The same year, Paine purportedly had a meeting with Napoleon. Napoleon claimed he slept with a copy of Rights of Man under his pillow and went so far as to say to Paine that "a statue of gold should be erected to you in every city in the universe." Paine discussed with Napoleon how best to invade England and in December 1797 wrote two essays, one of which was pointedly named Observations on the Construction and Operation of Navies with a Plan for an Invasion of England and the Final Overthrow of the English Government, in which he promoted the idea to finance 1000 gunboats to carry a French invading army across the English Channel. In 1804 Paine returned to the subject, writing To the People of England on the Invasion of England advocating the idea. In 1802 or 1803, Tom Paine left France for the United States, paying passage also for Bonneville's wife, Marguerite Brazier and their three sons, seven year old Benjamin, Louis, and Thomas, for whom Paine was godfather. Paine returned to the US in the early stages of the Second Great Awakening and a time of great political partisanship. The Age of Reason gave ample excuse for the religiously devout to dislike him, and the Federalists attacked him for his ideas of government stated in Common Sense, for his association with the French Revolution, and for his friendship with President Jefferson. Also still fresh in the minds of the public was his Letter to Washington, published six years before his return. Upon his return to America, Paine penned 'On the Origins of Freemasonry.' Nicholas Bonneville printed the essay in French. It was not printed in English until 1810, when Marguerite posthumously published his essay, which she had culled from among his papers, as a pamphlet containing an edited version wherein she omitted his references to the Christian religion. The document was published in English in its entirety in New York in 1918. Brazier took care of Paine at the end of his life and buried him on his death on June 8, 1809. In his will, Paine left the bulk of his estate to Marguerite, including 100 acres (40.5 ha) of his farm so she could maintain and educate Benjamin and his brother Thomas. In 1814, The fall of Napoleon finally allowed Bonneville to rejoin his wife in the United States where he remained for four years before returning to Paris to open a bookshop. Paine died at the age of 72, at 59 Grove Street in Greenwich Village, New York City on the morning of June 8, 1809. Although the original building is no longer there, the present building has a plaque noting that Paine died at this location. After his death, Paine's body was brought to New Rochelle, but as the Quakers would not allow it to be buried in their grave-yard per his last will, so his remains were buried under a walnut tree on his farm. 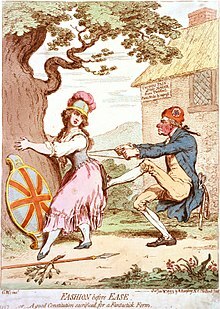 In 1819, the English agrarian radical journalist William Cobbett dug up his bones and transported them back to England with the intention to give Paine a heroic reburial on his native soil, but this never came to pass. The bones were still among Cobbett's effects when he died over twenty years later, but were later lost. There is no confirmed story about what happened to them after that, although down the years various people have claimed to own parts of Paine's remains, such as his skull and right hand. Biographer Eric Foner identifies a utopian thread in Paine's thought, writing that "Through this new language he communicated a new vision--a utopian image of an egalitarian, republican society." Paine's utopianism combined civic republicanism, belief in the inevitably of scientific and social progress and commitment to free markets and liberty generally. The multiple sources of Paine's political theory all pointed to a society based on the common good and individualism. Paine expressed a redemptive futurism or political messianism. Paine, writing that his generation "would appear to the future as the Adam of a new world," exemplified British utopianism. The religion that approaches the nearest of all others to true deism, in the moral and benign part thereof, is that professed by the Quakers ... though I revere their philanthropy, I cannot help smiling at [their] conceit; ... if the taste of a Quaker [had] been consulted at the Creation, what a silent and drab-colored Creation it would have been! Not a flower would have blossomed its gaieties, nor a bird been permitted to sing. Later, his encounters with the Indigenous peoples of the Americas made a deep impression. The ability of the Iroquois to live in harmony with nature while achieving a democratic decision making process, helped him refine his thinking on how to organize society. Note that £10 and £15 would be worth about £800 and £1,200 when adjusted for inflation. Lamb argues that Paine's analysis of property rights marks a distinct contribution to political theory. His theory of property defends a libertarian concern with private ownership that shows an egalitarian commitment to the redistribution of resources. Paine's new justification of property sets him apart from previous theorists such as Hugo Grotius, Samuel von Pufendorf, and John Locke. It demonstrates Paine's commitment to foundational liberal values of individual freedom and moral equality. The Christian religion is a parody on the worship of the sun, in which they put a man called Christ in the place of the sun, and pay him the adoration originally payed to the sun. I believe in one God, and no more; and I hope for happiness beyond this life. I believe in the equality of man; and I believe that religious duties consist in doing justice, loving mercy, and endeavoring to make our fellow-creatures happy. In 1819, Richard Carlile was sentenced to three years for publishing the writings of Thomas Paine in Britain. Thomas Paine's writing greatly influenced his contemporaries and, especially, the American revolutionaries. His books provoked an upsurge in Deism in America, but in the long term inspired philosophic and working-class radicals in the UK and US. Liberals, libertarians, feminists, democratic socialists, social democrats, anarchists, freethinkers, and progressives often claim him as an intellectual ancestor. Paine's critique of institutionalized religion and advocacy of rational thinking influenced many British freethinkers of the nineteenth and twentieth centuries, such as William Cobbett, George Holyoake, Charles Bradlaugh and Bertrand Russell. The first and longest standing memorial to Thomas Paine is the carved and inscribed 12 foot marble column in New Rochelle, New York organized and funded by publisher, educator and reformer Gilbert Vale (1791–1866) and raised in 1839 by the American sculptor and architect John Frazee — The Thomas Paine Monument (see image below). The same site is the home of the Thomas Paine Memorial Museum. Thomas A. Edison helped to turn the first shovel of earth for the museum which serves as a museum to display both Paine relics as well as others of local historical interest. A large collection of books, pamphlets and pictures is contained in the Paine library including many first editions of Paine's works as well as several original manuscripts. These holdings, the subject of a sell-off controversy, were temporarily relocated to the New York Historical Society and have since been more permanently archived in the Iona College library nearby. 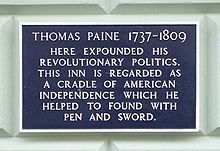 Also in Thetford is the Thomas Paine Hotel, on which is a plaque giving details of Paine's life, which was erected in 1943 by voluntary contributions by US servicemen. In the early 1990s, largely through the efforts of citizen activist David Henley of Virginia, legislation (S.Con.Res 110, and H.R. 1628) was introduced in the 102nd Congress by ideological opposites Sen. Steve Symms (R-ID) and Rep. Nita Lowey (D-NY). With over 100 formal letters of endorsement by US and foreign historians, philosophers and organizations, including the Thomas Paine National Historical Society, the legislation garnered 78 original co-sponsors in the Senate and 230 original co-sponsors in the House of Representatives, and was consequently passed by both houses' unanimous consent. In October, 1992 the legislation was signed into law (PL102-407 & PL102-459) by President George H. W. Bush authorizing the construction, using private funds, of a memorial to Thomas Paine in "Area 1" of the grounds of the US Capitol. As of January 2011, the memorial has not yet been built. The 1982 French-Italian film La Nuit de Varrenes is about a fictional meeting of Casanova, Chevalier de Seingalt (played by Italian actor Marcello Mastroianni), Nicolas Edmé Restif de la Bretonne, Countess Sophie de la Borde, and Thomas Paine (played by American actor Harvey Keitel) as they ride in a carriage a few hours behind the carriage carrying the King and Queen of France, Louis XVI and Marie Antoinette, on their attempt to escape from revolutionary France in 1791. Jack Shepherd's stage play In Lambeth dramatized a visit by Thomas Paine to the Lambeth home of William and Catherine Blake in 1789, first performed at the East Dulwich Tavern in London in July 1989. The play was later adapted for television in the BBC Two Encounters series - which featured similar fictionalized meetings between historical figures - and was first broadcast on 4 July 1993. It was directed by Sebastian Graham-Jones, and featured Bob Peck as Paine, Mark Rylance as William, and Lesley Clare O'Neill as Katherine (sic). In 2005 the writer Trevor Griffiths published 'These are the Times: A life of Thomas Paine', originally written as a screenplay for Richard Attenborough productions. A film has not been made but it was broadcast as a two-part radio drama on BBC Radio 4 in 2008  with a repeat in 2012 . In 2009 Griffiths adapted his screenplay for a production titled "A New World" at Shakespeare's Globe theatre on London's South Bank . In 2009, Paine's life was dramatized in a play 'Thomas Paine Citizen of the World' , produced for the "Tom Paine 200 Celebrations" festival in Thetford, the town of his birth. Ο “Αόρατος” Άνθρωπος της Πόλης. Εγώ έχω επινοήσει τον κόσμο που βλέπω. Υπάρχει ένας άλλος τρόπος να κοιτάξω τον κόσμο.